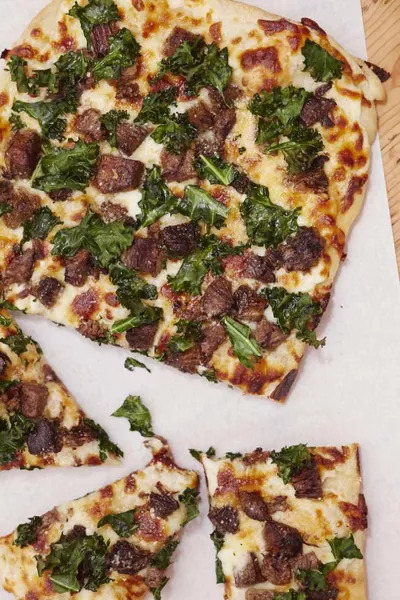 Pair lean beef with crunchy kale and a dash of cheese for a pizza you'll want to make again and again. You don’t need loads of gooey, goopy cheese and sauce to savor mind-blowing pizza. Just ask Giada De Laurentiis. The celebrity chef and Food Network star, who often pays homage to her native Italy by whipping up plenty of mouthwatering dishes, has added a new delicious twist to classic pizza bianca. Recognized for being lean, flat, and only featuring a touch of olive oil, this Roman dish can be on the plain, and dare we say, boring side. But fortunately for us, De Laurentiis has taken on the challenge to transforming this simple meal into an irresistible feast–and naturally, she succeeds. De Laurentiis’ take features a generous serving of juicy, thick beef pot roast, creamy parmesan cheese, kale for added crunch, and of course, olive oil for drizzling to your heart’s desire. And just when you could easily eat this entrée on its own, De Laurentiis also includes her own sauce of butter, whole milk, and a pinch of nutmeg for extra spice. You may never crave delivery again. And for those feeling hesitant on making pizza from scratch, we assure you that De Laurentiis’ recipe is simple and only requires several ingredients, which can all be easily found in nearly any market. Enjoy it with friends or devour it solo. We won’t judge. Preheat the oven to 450 degrees F. Oil a heavy nonstick 16"x10" baking sheet with olive oil. To make the sauce: In a small heavy saucepan, melt the butter over medium heat. Add the flour and cook for 1 minute, stirring constantly. Gradually whisk in the milk and add the nutmeg. Whisk over medium heat until the mixture thickens to sauce consistency and is smooth, about 6 minutes. Stir in the salt and pepper. To make the pizza: Using your fingers, stretch the dough onto the prepared baking sheet in a large rectangle. Spoon the sauce on top and spread evenly, leaving a 1-inch border around the edge of the dough. Sprinkle with the mozzarella cheese. Toss the pot roast with some of its pan juices to moisten and arrange on the dough. Sprinkle with Parmesan cheese. Bake the pizza for 15 minutes. Remove the baking sheet from the oven and top the pizza evenly with the kale. Drizzle with olive oil and sprinkle with salt. Bake for 8 minutes longer, until the kale is crispy. Remove from the oven, cut into squares, and serve.